Social media and content marketing may be used more frequently these days to help generate leads, but outbound prospecting remains king when it comes to the source that generates the most qualified opportunities. According to OneSources' recent B2B SalesPulse Report, which surveyed 136 B2B sales professionals, respondents rated outbound prospecting 3.7 out of a high of 5. It's no surprise that outbound prospecting delivers qualified leads, as it is a highly focused strategy that allows sales professionals to focus exclusively on the types of communities and sales titles that are in their "sweet spot." Mike Schultz, Publisher of RainToday.com, confirms such sales calls (also referred to as cold calls) work very well when properly executed. "I've seen cold calling work as a major part of a lead generation approach, yielding six clients in six months (a major acceleration of client additions), and increasing the pipeline by fivefold, for Deep Customer Connections, a management consulting firm in the insurance industry," Schultz writes in his article, Cold Calling Works: You Just Do it Wrong. Not far behind as a source of qualified leads is corporate websites, with a rating of 2.9 out of 5. Increasingly firms rely on their websites in content marketing campaigns, publishing articles, white papers, case studies and more to attract buyers, and buyers use the Internet more frequently to research solutions going to websites that rank high in search results and that other sources link to. While social media is down as an effective source of qualified leads, don't count it out. Sales professionals now say it's as effective as a traditional approach such as direct mail. In addition, Econsultancy's Effectiveness, Measurement, and Allocation Survey shows increased confidence in that tactic. Of the companies surveyed, 66% say they will spend more on digital marketing, with off-site social media being the number 1 method. 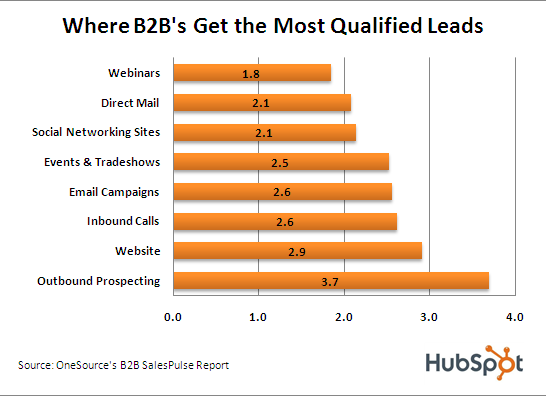 Another way to generate qualified leads is with Inbound Marketing. Listen to this archived webinar to learn more. Listen as Mike Volpe, VP of Marketing at HubSpot provides an Inbound Marketing overview during this 30-minute webina. Download the webinar now to learn how more than 230 professionals have been using inbound marketing to transform their businesses.